The Japan Foundation are proud to be a co-organiser of Japan Information day 2019. Along with other Japan related organisations and universities, we will be introducing our programmes, grants, and the work that we do in the fields of Japanese Language and Japanese Studies. With an increasing number of tourists as well as international students choosing Japan as their destination, British interest in Japan, including its higher education and research institutions, has been growing. The day aims to provide relevant professionals with information about various opportunities for graduates in teaching, studying and conducting research in Japan. This is the only annual event in the UK where attendees can learn about the diverse programmes in these fields. For more information including the event timetable, please click here. This event is free to attend, however prior registration is essential. The deadline for registration is 10th May 2019. The JF/BATJ Spring Seminar, Participatory Approaches and Drama for Learning, will take place on Saturday 27th April. This will be a hybrid seminar – participants may join in either in-person or online. Discounted fee applies until 10th April. The traditional Japanese lunch box, or bento, has undergone a number of metamorphoses over the long course of its history, becoming a staple and a unique point of pride in Japanese cuisine. Depending on the occasion, bento can range from a mass-produced lunch container available from railway stations, to lovingly hand-crafted compartmentalised meals set in equally stylish lacquerware. However, the most notable transformation may be perceived in the category of home-made lunch, the ingredients of which not only form an appetising meal but also, with increasing intricacy, a visually engaging one. This is known as kyara-ben (character bento) and it is particularly enjoyed by children, who will often receive bento bearing the likeness of famous manga and anime characters. 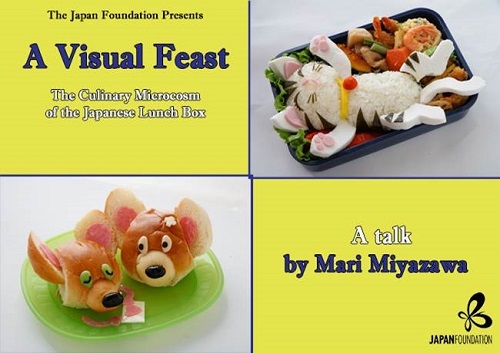 In collaboration with the Flatpack Festival, we are happy to welcome Mari Miyazawa — a leading bento arranger and animation filmmaker whose work includes short films such as Twins in Bakery (2013) — to talk about the development of vibrant bento creations in Japan. Herself having invented a similarly illustrative genre of oekaki-ben (picture bento) in which food is arranged to resemble an intricately decorated scene or landscape, Miyazawa will also provide an introduction to turning ingredients into edible characters, revealing how her ideas attain the balance between nutrition and visual appeal. This event is aimed at showing our audience that creating an edible work of art is something enjoyable everyone can do and be proud of! This event is run in partnership with the Flatpack Film Festival as part of which two of Miyazawa's film shorts will be screened in the Trailblazers collection in Birmingham, and where she will run two workshops demonstrating how to create Character Bento. The Japanese Language Proficiency Test (JLPT) is a test which evaluates and certifies the Japanese-Language Proficinecy of non-native speakers of Japanese.The test is conducted twice a year, in July and December, in Japan and various locations around the world. The next JLPT will take place on Sunday 7th July 2019, at two locations in the UK: London (SOAS University of London) and Edinburgh (the University of Edinburgh). Please note that registration to take the test at SOAS and Edinburgh have both now CLOSED due to the test centre reaching maximum capacity. Please refer to each university’s website for registration details. SOAS University of London Registration at SOAS has now CLOSED as the test centre has reached maximum capacity. The University of Edinburgh Registration at Edinburgh has now CLOSED as the test centre has reached maximum capacity. Please note that the registration at each test centre may close early when the test centre has reached its maximum capacity. For more information about the test, please visit the JLPT website. Click here to download a guide to the 2019 Japanese-Language Proficiency Test. 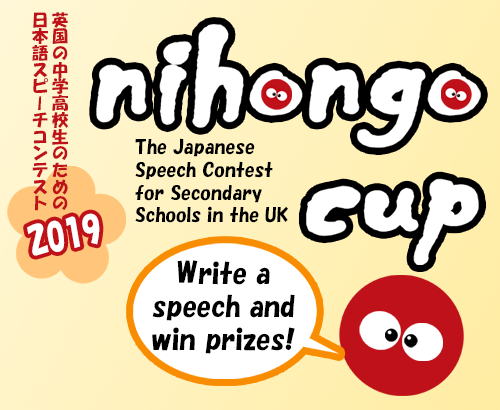 Nihongo Cup is the Japanese Speech Contest for Secondary School students across three categories: Key Stage 3, Pre-GCSE Key Stage 4/5, and Post GCSE Key Stage 4 and 5. Finalists will be invited to perform their speech at the Nissan Institute of Japanese Studies, University of Oxford in front of a panel of judges and VIPs from the field of Japanese language education and Japan-UK relations, for the chance to win some fantastic prizes – including a trip to Japan! Finals day will take place on 22nd June 2019 (Saturday). Finals will take place at the Nissan Institute of Japanese Studies, University of Oxford. You can also find articles about previous Nihongo Cup finals on our News Page. To find out more and for application forms, you can download the Zip file linked below. Nihongo Cup is organised by the Association for Language Learning (ALL) and the Japan Foundation London. On the 10th and 11th May 2019, the Nissan Institute of Japanese Studies at the University of Oxford will host an international graduate-led conference to commemorate the 150th anniversary of the Meiji Ishin, commonly known in English as “The Meiji Restoration”. The conference seeks to promote renewed historical understandings by revisiting the “Opening of Japan” as an aspect of the birth of “modern Japan”. Until now, the “Opening of Japan” has mainly been understood as the opening of the nation to “the West”, its political discourse, and the accompanying ideas of civilisational progress. However, as Japan opened its borders to a specifically “Western” modernity, it simultaneously opened to competing visions of progress, conceptions of time, and new forms of social organisation. At the same time, with the multiplication of its transnational connections and multilateral flows of knowledge-transfer, the world seemed as much to be opening up to Japan as it did vice versa. This event is free and open to the public. For more information and registration please visit the event website. Sign up here for our monthly e-bulletin.